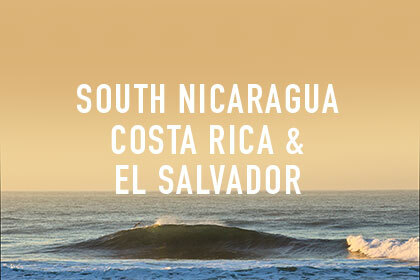 Just over three weeks of wedgey Nicaraguan perfection, awesome Costa Rican beach breaks and Salvadorian barrels. This trip offers up the best of central America and will fulfill the needs of any wave hungry bodyboarder. You’ll need to fly in to Managua in Nicaragua to begin the trip and out of San Salvador in El Salvador on your final day. You’ll stay in awesome accommodation only a short walk from some of the worlds most beautiful beaches. Our guides will be on hand to make sure that you are in the right place at the right time each day to score perfect waves. It’s really that simple! Travel from southern Nicaragua to Costa Rica and from Cost Rica to El Salvador is organised by us but covered by you. We’ll give you further details about this at time of booking. You should budget around £100 on top of the trip price for this. For further information on our Southern Nicaragua Trip click here. For further information on the Costa Rica Trip click here. For further information on the El Salvador Trip click here.